Both iconic and unusual firearms from the mid-1800s through early 1900s – revolvers, semiautomatic pistols, shotguns, rifles, machine guns, and even a few cannon – complete with their accessories and variants. All the associated gear: ammo, cartridge belts, fast-draw rigs, and hand grenades that don't rely on a fizzing fuse. Rules unique to period designs, covering both defects and innovations . . . which were often one and the same! 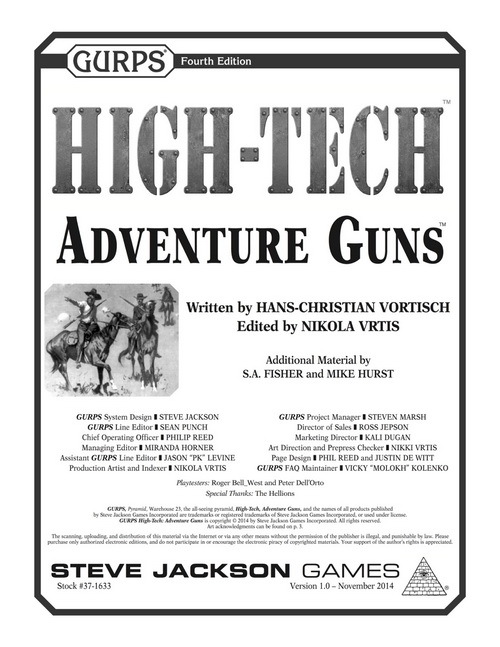 Support for the crazy stuff that adventurers get up to, like customizing weapons, improvising ammo, rigging traps, and even mounting TL5-6 cannon and machine guns on steampunk spacecraft. Bits and pieces needed to get into costume: the history and description of each weapon, a glossary of slang, guidelines for converting costs to period currency, and notes on firearms legality. 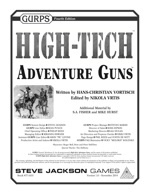 GURPS High-Tech: Adventure Guns takes a magnifying glass to one of the most interesting eras covered by GURPS High-Tech and reveals details that will have your TL5-6 heroes shooting up the scenery in style. For extensive rules and information on realistic guns and shooting, check out GURPS Tactical Shooting. There's more to steampunk games than awesome Victorian firearms! Bring flavor and fun to your settings with GURPS Steampunk 1: Settings and Style! Check out the Pulp Guns line! If you're looking for a perfect opportunity to use the items from this catalog, mosey over to Pyramid #3/74: Wild West.